Little informations about this computer. The Vectrix VX 384 was not a stand-alone computer. It was designed as a graphics display, accepting commands from any host through the Centronics or RS-232 port to fill the frame-buffer and drive the external monitor to the indicated resolution. Mainframes to minicomputers to Macs and PC's were used to send graphic info to the VX 384. 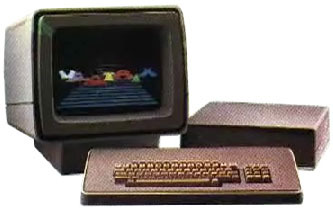 When the VX 384 was initially released, the PC graphics options were CGA or Hercules monochrome. A smaller model was launched a few time after : the VX128 (VRAM 128 KB and 8 color available per pixel). Vectrix systems were used in a number of medical and manufacturing applications. I was one of the software engineers on the Vectrix VX384. The VX384 was revolutionary in that it had vector 3D computer graphics algorithms built right into the ROM. Commands could be issued to rotate, scale, and translate a model in 3D. The vast majority of the firmware and the original conception for the device was done by Richard Katz, who founded the company in 1980. The VX384 gets its name from the 384K of memory inside. That allowed for an odd 9-bits of graphics display (512 colors). A lower cost VX128 was also offered, but it only three planes of color (8 colors). Fewer of these were sold. Later, a dual IBM-PC graphics card version was developed for IBM (code-named the MIDAS project) with the same architecture and command set. IBM eventually decided to use another company's design for their Professional Graphics Adapter. The VX384 was also used as the basis of a television weather graphic system installed in about 50 television stations in 1985 and 1986. I wrote the Vectrix paint system for the IBM-PC called PaintPad. It was hand coded in 8088 assembler. Rock star Todd Rundgren wrote an Apple II paint program for the VX384 which was also sold by Vectrix. see more Vectrix VX 384 Ebay auctions !